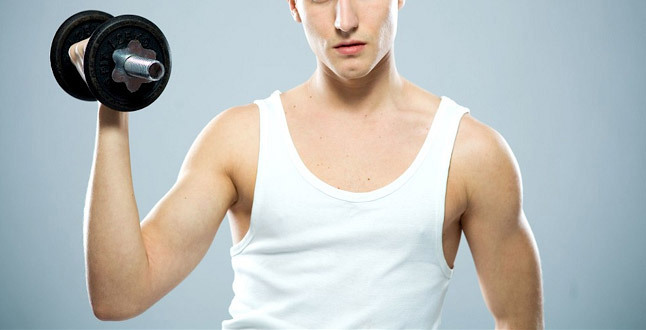 There’s just one problem: you’re not gaining any noticeable muscle. Yes, there’s nothing more frustrating than committing yourself to a muscle building program and not seeing any appreciable changes to your appearance as each week passes. If you truly aren’t getting any return on your muscle building efforts right now, the immediate fix is likely very simple and straightforward. Before I give you the 3 simple reasons why you aren’t gaining muscle right now, let me first clarify that achieving significant gains for an average natural trainee takes time and patience. If you’re idea of “failing” to gain muscle is that you haven’t put 2 inches on your arms in 4 weeks, it’s time for a reality check. This whole thing is a gradual process, and if you’re gaining somewhere around 0.5-1 pounds of relatively lean body weight per week and your lifts are going up in the gym consistently, you’re definitely on the right track and just need to give it more time. Mistake #1: You’re Not Training Hard Enough, Period. Muscle growth is an adaptive response to stress. If you aren’t using up a sufficient percentage of your muscle’s available momentary resources on each individual set, your body has NO incentive to build upon its existing resources by increasing the size and strength of the muscles. Your body has no idea that you’re standing in an air-conditioned gym lifting barbells, dumbbells and cables. All it is doing is responding to the direct physical demands placed upon it. And if it already has enough available resources to respond to those demands with relative ease, there is no need for any change to occur. So buckle down, and get serious. Every single set should be a fully focused effort, and those last few reps should be downright uncomfortable and tough to perform. If they aren’t, you’re just not training hard enough. My recommendation is to perform every set within the 5-12 rep range, and to continue the set at least 1-2 reps short of concentric muscular failure. Concentric failure is the point in the set where you cannot complete an additional rep using proper form despite a 100% all-out effort. 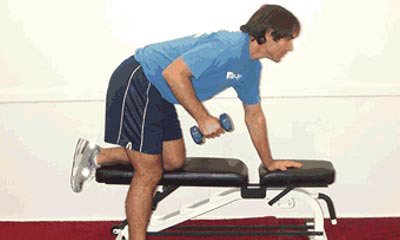 This level of intensity will be sufficient to stimulate hypertrophy to an optimal level. 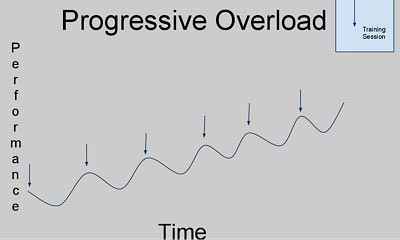 Mistake #2: You’re Ignoring The Law Of Progressive Overload. Putting forth a good hard effort in the gym is the foundational first step, but it’s only half of the equation. That’s because in order to see continual, ongoing gains in muscle size over time, you must be continually progressing in the amount of weight you lift and/or number of reps performed on all of your major exercises. This is known as the “law of progressive overload”, and it is absolutely central to your entire training program. If you’re bench pressing 150 pounds today, and are still using the same weight 8 weeks from now, your body will again have no incentive to adapt further, and your muscle gains will stagnate. Solution: keep a training logbook, and for every workout that you perform, write down the exercises utilized, weight lifted and number of reps executed. Then, center the entire focus of your workout program around “beating the logbook” by either adding extra weight to the bar on the following workout (usually 5-10 pounds for big compound lifts and 2.5-5 pounds for smaller isolation lifts) or squeezing out a few extra reps with the same weight (while staying in that 5-12 rep range). You’ll be amazed at how quickly this adds up over just a few months. This simple combination of training 1-2 reps short of concentric failure on every exercise and progressing in weight/reps every single week is a sure-fire, 100% guaranteed recipe for ongoing muscle growth. If you aren’t seeing measurable progress right now, one or both of these factors is off. Mistake #3: You’re Not Eating Enough. You’re overall calorie intake is too low. I’ve talked about this a million time before, but if you aren’t creating a consistent “calorie surplus” every day by consuming more calories than you burn, you are NOT going to gain any appreciable amount of muscle. Your body already has energy demands in place in order to sustain your current body weight, and it must be provided with the extra fuel necessary in order to build new muscle tissue. If your overall body weight isn’t budging, you can be guaranteed of the fact that you’re simply not eating enough. To get some good starting point numbers for your individual calorie needs to gain muscle, just plug your stats into my free bodybuilding macronutrient calculator. 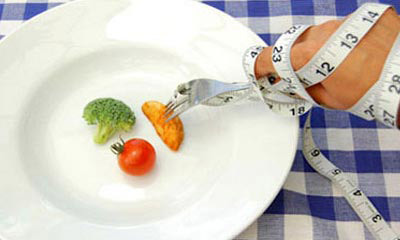 It’ll show you exactly how many calories you need each day, along with a breakdown of protein, carbs and fats as well. I’m certainly not claiming that these 3 points are the be-all-end-all of building lean muscle, but they do make up the foundation of the entire process and are by far the most important principles to be aware of. Yes, there are many other things you can do to optimize your gains, but if you just employ these 3 strategies consistently, you WILL gain muscle on an ongoing basis. It would be physically impossible not to. And on the flipside, if one or more of these elements is not in place, it will be physically impossible for you TO gain muscle, or at least to gain any significant amount over time.